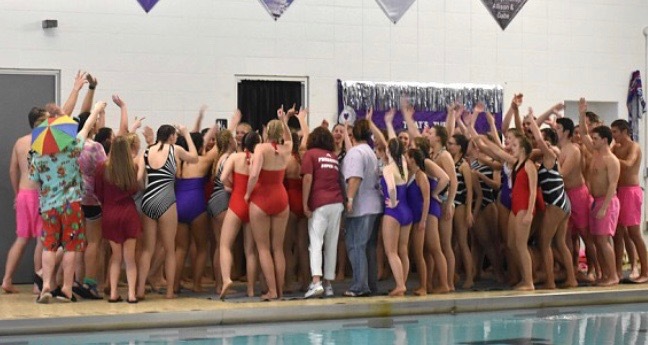 Members of the Dolphins, the West Bend High Schools’ synchronized swim team, crashed the April 9 school board meeting to persuade district officials to allow the natatorium lights to be turned off during their show scheduled to open just three days later. Traditionally the show depends upon a darkened room for effect, but this school year the team had been notified that the lights could not be turned off for safety reasons. The Dolphins were concerned because the planned show included a blacklight performance with effects only noticeable with the lights completely turned off. Because of the overwhelming support from the team and the efforts of the event coordinators, the performance went on with the lights off. However, there is still some ambiguity about when the problem with the lights emerged and what will happen in future years. Dolphins president Olympia Wundrock and vice president Amy Geenen were the dolphins who spoke at the meeting. The Dolphins show included special effects involving the lights being turned off. The reason that the dolphins were told they needed to keep the egress lights on was for safety precautions in case of an emergency and many government rules and regulations that need to be followed by commercial buildings. Director of facilities Dave Ross worked with the Dolphins to find a solution for this year’s show. To solve the problem, Ross added some battery backup fixtures to outlets located above the bleachers. Those lights, at least, would come on if the power went out. There is still some confusion about when the Dolphins were first informed about having to keep the egress lights on for the show. Some team members say they didn’t know about it until a few days prior to the show, but Laura Jackson, the assistant superintendent, says the team received a letter last April. That message was reinforced at an April 6 meeting between the team and district officials, including Ross and Jackson. Ross says the lighting has been an ongoing concern for the last five or six years, but he’s now focused on the future. “My thoughts now are we got through this year’s show, now we have to concentrate and figure out how next year’s is going to be better and with no issues,” Ross said. Dolphins adviser Melissa Hoogester did not respond to requests for comment. 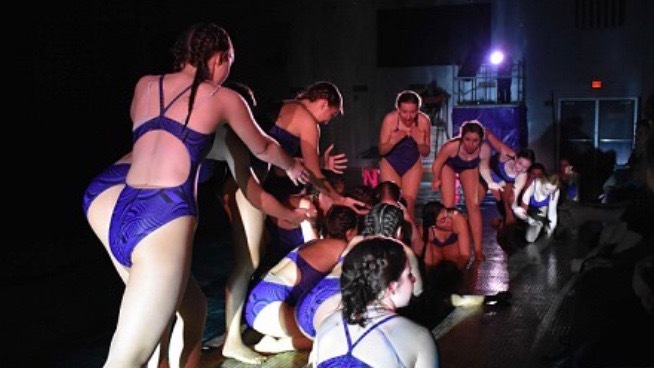 Dolphins begin their performance in the spotlight. District officials were impressed with the students in Dolphins and how they came together to work toward a common goal. Jackson also was glad to see the students voicing their concerns. This year was the 55th anniversary of the Dolphins show, and the team was a lot larger than it has been in the recent past. With new members joining across all grade levels, the team consisted of 49 dolphin girls, 11 dolphin boys, 4 MCs and many lighting and crew members. ​The 2018 WBHS Dolphins team is the largest it has been in years, with many new members across all grade levels.